Is this able to act like the R78E 5v switching voltage regulator? Hi! I was wondering, is this part easy for a novice to use? Is there a comprehensive guide to show how to use it? Also, would I need to buy any additional parts in order to boost the voltage of 4 AA's to 12v? I'd also agree with the skill levels being wrong... no programming required, and the prototyping skill level should be higher as there's some long math equations involved. Plus you could (potentially) be dealing with dangerous voltages and currents. which explains the theory of operation, and also has the mathematical equations to calculate the necessary component values for any desired output voltage. Not to mention that unlike a linear regulator, you can power loads over a hundred mA or so without burning yourself or having a completely ridiculous heatsink. How did you configure the transistor to increase the current? Can you show me a picture or schematic? I'm pretty sure there is an error calculating Ct, it is off by a factor of 10. I could be wrong but it is best to double check yourselves. Try it, put in the example initial values found in the AN920-D reference sheet. I just sent a email to the author, looks like it was written a long time ago. In any case it is best to double check the values yourself. Ignore my last comment on this part. I've got a better idea. This IC can't be wired straight to the mains, because its maximum supply voltage is 40 volts. But what if I wire it up like this? Would that work? Â¹ To limit inrush current while the capacitor charges up. What would be a good value to use? 10 ohms? 22? 47? 100? Â² In my country we have 220V mains, so I can't just use a 200V capacitor. Actually I think any capacitor rated for 330V or higher would be ok, but you never know, one of these days I could get a voltage spike and, after taking everything apart, a blast of blue smoke. Â³ I will actually use a cap rated for at least twice the zener diode's voltage. So obviously I won't use a 16V cap and a 12V zener. If I use an external MOSFET, can I connect it to the MC34063 and switch (already rectified and filtered) mains electricity? If so, can you recommend a part number for a MOSFET that can handle 400V? Sorry for the long comment. Please answer as soon as possible. I don't need this for next week or anything like that, but the sooner the better. Even at low currents, that zener is going to COOK. Just pick up a small transformer, they're cheap. This little guy is pretty epic. Im using a few of these to power Vintage Nixie tube projects from 12v. For those unfamiliar Nixie tubes are old Neon displays used before Leds and LCD where invented. To get one to light you need over 100-180v of power to "fire" and then feed them a few milliamps to keep them running. This little fella in step-up setup can deliver power up to the required voltages and supply my project with a few dozen milliamps making it a very cost-effective way to get a high-voltage supply. So don't dismiss these little regulators. they can do some pretty amazing things. Oh and if clueless about calculating the right values there are multiple calculators around on the internet to help. naturally i'd advise to use those as guidelines and to try and check their accuracy. Also anyone else noticing the wrong skill checklist? this clearly requires experienced prototyping and doesn't require any coding. I was looking into using this switching regulator for 5V --> 3.3V step-down for an XBee but was told by Digi that switching frequencies below 500kHz might interfere with the XBee. Does anyone know if that is true or not? I can use it for Step up 1.2v to 5v? Under no load I get a perfect 5V on the output. However when under a .3A load the output voltage drops to 2.5~3.0 Volts. Anybody have any idea's what i'm doing wrong? I'm trying to use this chip to step up the voltage on a 3.6volt LIPOLY battery to 5 volts. I'm choosing between this and lt1303 form digikey: http://www.digikey.sg/product-detail/en/LT1303CN8%23PBF/LT1303CN8%23PBF-ND/889063. which do you think would give more amps with the same configuration? Can anyone tell me maximum output voltage of this thing? Right now I'm using a TL499a to stepup 6v to about 26v at 10mA... would this chip be able to do the same job? I've looked thru the datasheet and the application note and I can't find this info anywhere, what am I missing? there is also a very comprehensive video tutorial about MC34063A. I've used this as a current mode power supply for 4 HB LEDs. Btw, for a guy relearnig his HS electronics after 30 years, what is Vripple and Fmin? Vripple(pp) â Desired peakâtoâpeak output ripple voltage. In practice, the calculated capacitor value will need to be increased due to its equivalent series resistance and board layout. The ripple voltage should be kept to a low value since it will directly affect the line and load regulation. fmin â Minimum desired output switching frequency at the selected values of Vin and IO. Ideally, if I put in 10V at 1A max, can I get 5V at 500mA max, and vice versa? 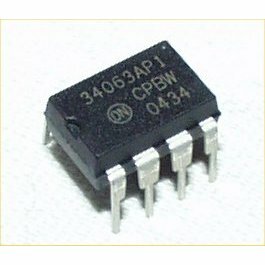 Will this chip work at 2.4v input? I want to power an ATmega328 with 2 x 1.2v AA batteries. I just bought one of these, seems like that's the sort of thing you're looking for. That whole family on DK is great for that kind of thing, I've used a V7805 in the past when I had a normal 7805 running too hot for my tastes, worked like a charm. Could I use this to power an ATTiny with 1.5V OR 9V? EDIT: Never you mind, I'm going to power it with a definite 3V (coin battery). EDIT: You may mind again... although I don't need an answer anymore. EDIT: Never mind again, this is not suitable for my purposes. So I just built a circuit using one of these to step up voltage from 3.3V to 5V (one of the sensors I am using is 5V while the Arduino Pro is 3.3). I used a 1N5819 diode and a 180 uF input capacitor. Any ideas what could be wrong? Why is the supply voltage fluctuating so much? EDIT: Nevermind...check your circuits! I had one of the grounds connected to pin 3 rather than pin 4. Hey, i see in the Sparkfun eagle library there is a 34063 SMD part, but no PTH. Is this part an SMD? As seen in the datasheet, there are SMT and DIP versions of the part. * DIPs go in PTHs. No. This is a DIP package. If the legs go straight down, it's PTH. I assume these are the correct ICs - why was the MC34 -part left off? Yes, it's the correct IC. It's from ST instead of On. I guess they abbreviate the markings so they can fit in the other stuff. The On datasheet, documents markings, but the ST datasheet doesn't. That is the exact power supply that I'm looking to build, for the same purpose of powering XBees. I'm a bit unsure what I should have for Vripple and Fmin. Can you tell me which components you used?